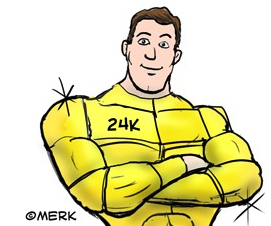 Merk Insights - Gold Now? When referencing 'fear' driving the markets, most think of a terrorist attack, political uncertainty or some other crisis that impacts investor sentiment, and sure enough, at times, the price of gold moves higher when this type of fear is observed. While that may be correct, I don't like an investment case based on such flare-ups of fear, as I see such events as intrinsically temporary in nature. We tend to get used to crises, even a prolonged terror campaign or the Eurozone debt crisis; whateveras the 'novelty' of any shock recedes, markets tend to move on. Having said that, I believe fear is under-appreciated - quite literally, although in a different sense. Fear is the plain English word for risk aversion. When fear is low, investors may embrace "risk assets," including stocks and junk bonds. A lack of fear suggests volatility is low; as such, investors with a given level of risk tolerance may understandably re-allocate their portfolios so that the overall perceived riskiness of their portfolio stays the same. While retail investors might do this intuitively, professional investors may also do the same, but use fancy terminology, notably that they may target a specific "value at risk," abbreviated as VaR. Conversely, our analysis shows that when fear comes back to the market - for whatever reason - 'risk assets' tend to under-perform as investors reduce their exposure. Assuming you agree, this doesn't explain yet why gold is often considered a 'safe haven' asset when the price of gold is clearly volatile. To understand how the price of gold is affected relative to risk assets, we foremost need to understand how risk assets move; after all, remember our premise that gold doesn't change, the world around it does. A traditional way to value a risky asset is with a discounted cash flow analysis. With equities, for example, one adds up expected future earnings, but discounting the future earnings stream. When future cash flows are uncertain, analysts apply a higher discount factor to future earnings, thereby deriving a lower value. When investors apply a high discount factor - be that because they are uncertain about the business (think of unproven biotech or young tech firms) or about the market as a whole (a broader sense of fear), we believe this theory dictates a greater focus on short-term cash flows (as future cash flows are more heavily 'discounted'). As a result, we believe it's reasonable for share prices to be lower and more volatile when fear is higher. If you have followed me so far, you may be thinking: but gold doesn't pay any dividends! Correct, and that's why we reason that the price of gold is not as affected by changes in the 'fear factor' because, again, gold doesn't change. Note that it is not correct that gold always does well when 'risk is off' in the markets. There are periods when the price of gold moves in the same direction as equity indices; and there are times when it moves in the opposite direction. In fact, since former President Nixon severed the tie between the U.S. dollar and the price of gold in 1971, we have observed a zero correlation to equities. And that is how it should be given that the cash flows of gold (of which there aren't any) are not correlated to the cash flows of corporations. Ultimately, of course, prices are dictated by supply and demand. And even as gold may not have cash flows associated with it, the supply and demand of gold may be related to the health (expected cash flows) of users and producers. It's in this context that I often mention that we believe gold is less volatile than other commodities because it has less industrial use. Taking copper, for example, it doesn't change either (well, it oxidizes), but supply and demand dynamics are far more elastic (volatile). And of course, just like any asset, prices can be distorted, even for a considerable period. For example, I allege that the price of gold moves more like a 'risk asset' when gold has been hijacked by momentum investors, thereby potentially turning it into a proverbial hot potato. With this framework provided, let me get to a point I have been making about the markets for some time: in our analysis, the Federal Reserve, in conjunction with other central banks, worked hard to take fear out of the markets. That is, central banks "compressed risk premia," i.e. making risk assets appear less risky. As a result, risk assets from stocks to junk bonds rose on the backdrop of low volatility (when junk bond prices rise, their yields fall). Conversely, as the Fed is trying to engineer an exit, we believe risk premia will rise again. All else equal, we believe this suggests more volatility (more fear) and lower equity prices. If you agree with the logic outlined here, an environment in which the Fed is pursuing an exit may be favorable to the price of gold. And it's not because investors are fearful of another terrorist attack, it's because fear has been suppressed, yet the world is a risky place; and if market forces have it their way, fear as a healthy part of the markets will return. It also means that, all else equal, we believe the price of gold should be higher relative to equities. But all else isn't equal, as interest rates might be moving higher. At least that was the story we were told for years as the Fed was preparing the markets for an 'exit'. Given that markets tend to be forward looking, investors seemed to be fleeing the precious metal. After all, the real competition to a shiny brick that doesn't pay any interest may be cash that does pay interest. Cash, though, is an artificial construct, and investors have every right to be skeptical. Notably, investors may care more about the real interest they receive on cash, i.e. the interest after inflation is taken into account. While we are told what inflation rates are through official statistics, investors may choose their own perception of inflation in making investment decisions. Instead of high rates, the world appears to be in a rush to go negative. Bloomberg recently wrote that one third of 47 countries in their global survey have negative 2-year government bond yields.1) Sure, in the U.S. rates are positive, but will the Fed be able to pursue its exit? Can we get real interest rates that are significantly positive? Or are we heading the other direction, i.e. is an economic slowdown coming that might take rates down further? In a recent editorial in the Washington Post, former U.S. Treasury Secretary Larry Summers "puts the odds of a recession at about 1/3 over the next year and at over 1/2 over the next 2 years." He then suggests that a "400 basis point cut in Fed funds ... is normally necessary to respond to an incipient recession." The way we assess the Yellen Fed is a bit like an ocean tanker, i.e. it moves very slowly. The reasons for that we discussed in a recent Merk Insight, but have mainly to do with the fact that Yellen is a labor economist and, as such, typically looks at data that will lag developments in the real economy. To us, this suggests risk premia may continue to widen (causing risk assets to remain under pressure), and that any rally in the markets may be a bull trap, i.e. deceptive. In our assessment, investors are likely to use rallies to diversify their portfolios as they continue to be over-exposed to equities and other risk assets. The question is whether gold will be part of their diversification efforts. We think investors may want to consider adding a gold component to their portfolio. To expand on the discussion, please register for our upcoming Webinar entitled 'Gold to Beat Stocks?' on Thursday, February 25, to continue the discussion. Also make sure you subscribe to our free Merk Insights, if you haven't already done so, and follow me at twitter.com/AxelMerk. If you believe this analysis might be of value to your friends, please share it with them.